San Francisco Chronicle, by Kenneth Baker. Complicating things does not necessarily enrich them. But the newly complex work of Los Angeles painter Patrick Wilson at Marx & Zavattero extends the range of subtlety and ambiguity that has always given his art substance. Wilson makes patterns of rectangles - some open, some solid, some seemingly translucent - in acrylic on canvas. From a distance, and in reproduction, the paintings appear uniformly flat. But close viewing finds finishes and thicknesses varying subtly among the color areas that compose each canvas. Viewers can see that Wilson's process involves masking off areas and troweling on unnumbered layers of color within them. But how much control he has over chromatic effects as the layers accumulate and the quotient of planning his compositions entail are hard to guess. Wilson's meticulous control hints at careful forethought, but just try unpacking the work's makeup in detail. Ground colors at a picture's periphery and a tracery of open rectangles running over areas where canvas tooth shows through probably indicate decisions made early and late in the work's making. But where color areas stack up and illusions of translucency develop, we have to imagine Wilson adapting as he sees how things go. Wilson has titled his exhibition "Slow Motion Action Painting." Harold Rosenberg's contested term for Abstract Expressionism, "action painting," implies speed and spontaneity. Wilson's method reflects patience and a slow, shifting tempo of decision and execution. In "Stone Fruit" (2012) and the other more compact pictures here, the combination of the planned and the unplannable generates a hypnotic power that goes beyond the chiming of hues. 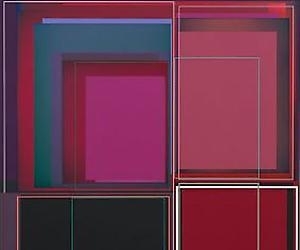 Wilson's paintings can spark associations to disparate markers of the abstract mainstream, including Josef Albers (1888-1976), David Simpson and Peter Halley. But more immediately, Wilson gives form to our increasingly fraught sense of having to change cognitive frames or focal planes countless times just to get through an ordinary 21st century day. Someone has to teach us how to love that effort, and Wilson does.